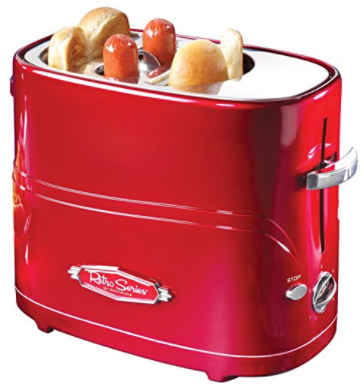 With the Nostalgia Retro Series Toaster, you can whip up 2 juicy hot dogs and 2 fresh buns in under 6minutes. The cooking timer is adjustable, so you can easily cook your dogs to individual preference. You can also use the ‘stop’ button to bring your meal preparation to an abrupt halt. Kitchen neat freaks will be happy to know that the Retro Toaster has a drip tray to make for easy cleaning. The hot dog cage is removable, making it easy to clean, too. The Pop-Up Toaster comes equipped with a pair of mini-tongs, which make for convenient removable of your cooked dogs. You can also use the tongs to remove your toasted buns without risk of them crumbling. The greatness of this toaster resides in its ability to make a regular task – cooking hotdogs – far easier and efficient for the consumer. It’s a good, reliable addition to your kitchen tech!